It was once the biggest town north of San Francisco and west of Chicago, with a population of more than 5,000, surging to 15,000 at one point. Yale in B.C.’s Fraser Canyon, now a village housing around 100 people with more living on nearby First Nations reserves, has a rich history as a transportation hub dating back to the Gold Rush days of the 1860s. Yale was a key location on the gold rush trail, as far up the river as paddle wheelers could travel before eager miners would have to switch to pack horses. Yale has weathered ups and downs, partially flattened when the railway was built, bypassed when the Coquihalla Highway was opened, and affected when nearby lumber mills shut down due to forest industry decline. UFV students taking Geography 360 (Applied Planning) had the opportunity to dream big for the tiny village as part of their major planning project. 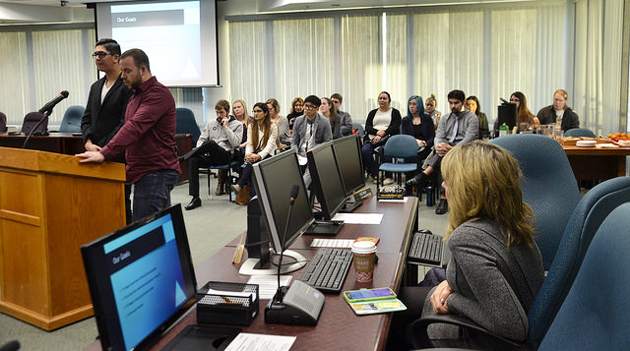 And then they presented their visions to representatives of the Fraser Valley Regional District. 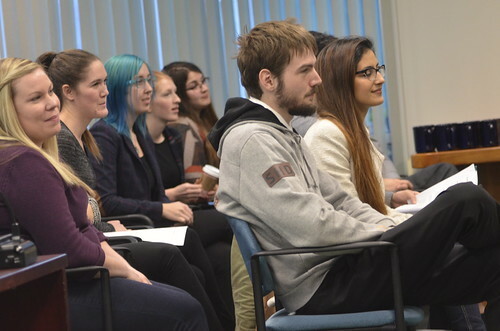 Professor Cherie Enns challenged the students to imagine a brighter future for the community, one tied into the possible development of a nearby all-season resort by the Barrick Gold Corp, which owns an abandoned mine site in the area. “I asked the students to develop background research on Yale and its surrounding area, which will provide important data for any future regional planning process,” Enns notes. Research ethics and time limitations meant that the students didn’t interview Yale residents face to face, but rather did background research and literature reviews, and proposed public consultation strategies. They also reviewed current zoning and land use. And then they prepared guidelines and a vision overview for Yale, choosing their own research theme. Themes chosen included recreation and parks, aboriginal tourism, the potential for a local microbrewery, heritage-themed tourism, planning for mitigating crime risks, and improving transportation and health care options. An common thread of the presentations was finding ways to encourage people to stop and experience Yale, rather than zooming through it. Margaret Thornton, director of planning and development for the FVRD, works annually with Enns to identify potential projects for the planning students to tackle and present to FVRD representatives. Thank you to Anne Russell for documenting the yearly applied planning opportunity for Geog and the Environment students at UFV. Thank you to the students for their dedicated course work and exciting ideas for future of Yale. My pleasure, Cherie and Margaret. Always interesting to chronicle what your planning students are up to! This was another great project and provided very useful insight and research into the Yale community. The partnership with UFV has provided valuable and useful research. Thank you UFV, Professor Enns and to all the Geo students. vous permettra de comprendre plus en détail les différence entre les robots multifonctions dans le but de savoir quel robot multifonction choisir.